Very effective, scientifically developed and comprehensive composition of thermogenic substances, which in natural form are found only in small quantities in food. L-tyrosine, extract from sour orange, extract from green tea (source of EGCG catechins), extract of black pepper (source of piperine) and caff eine jointly stimulate the lipolisis and thermogenesis processes. The very strong and effective composition was designed with the use of high doses of the most concentrated active substances and ultra spacious MEGA CAPS® capsules. The product facilitates the reduction of reserve fat and development of lean muscle mass, ie development of perfect definition of the body and extreme exercising capabilities. 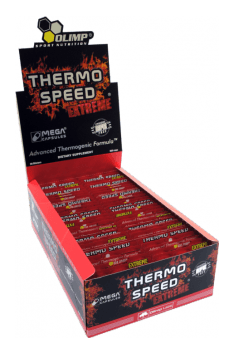 Thermo Speed Extreme 30 caps. Take 1 capsule 2 times a day – 30 minutes before breakfast and dinner. In case of using the preparation for the first time, it is recommended to take half a recommended dose for the period of 2 weeks and then gradually increase to the dose recommended by the producer. The preparation should not be taken before sleep, the last capsule should be taken around dinner. In case of using other preparations of similar effect, consult a specialist. Bulking agent - microcrystalline cellulose, anti-caking agent - magnesium stearate; capsule (gelatine, colour: E 171).